A large multinational manufacture of household products in Brazil approached one of our distributor partners with an coupling problem. They had an array of roof mounted pumps that were exposed to all the elements of hot summer sun and torrential rain in the winter months. These extreme climactic swings were causing the metal hubs of the original equipment couplings to rust and corrode making the coupling changes very difficult. To replace the elastomeric elements you would need to move the hubs along the shaft. This was becoming more and more difficult as time went on. The Lovejoy solution was to use a Jaw In-Shear style of coupling. This would allow the element to be changed without the hubs being moved. The customer was ecstatic and changed all five over the next two months. Even though the cast iron hubs of the JIS couplings were still exposed to the elements and would rust, the element and the stainless steel ring would not rust or corrode. This allows for easy replacement and limited down time. The maintenance manager of the facility has stated that the JIS element change takes less than 30 minutes where the old system was down for at least 24 hours. The end customer has written this up their companies best practices and will consider the JIS style coupling for all the pumps in his facility. On a closing note, the life he is getting from the Lovejoy JIS coupling is a minimum of three times what he was experiencing from the original OEM couplings. 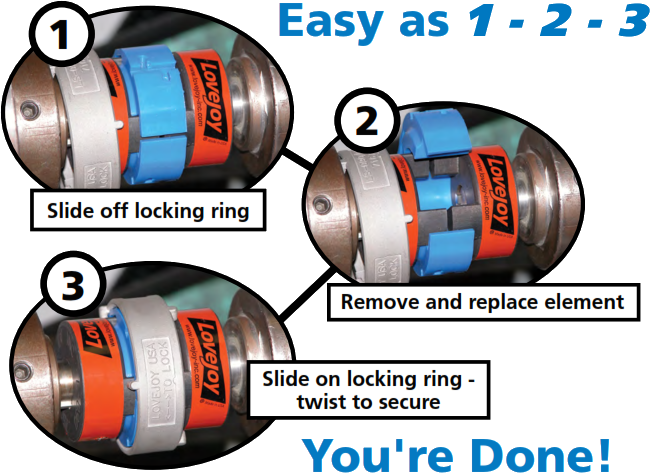 To source a Lovejoy coupling in Brazil, please visit visit Setax or a Setax approved distributor. For other parts of the world, please use Lovejoy's Find a Distributor tool. About the Author: Doug Durham has several decades of power transmission engineering sales expertise. To tap into Doug's rich industry knowledge and experience, please contact him through the Lovejoy webpage and/or find a highly qualified Lovejoy distributor through Lovejoy's Find a Distributor tool.